From personal experience, I know that freshman year is hard. It's a completely different school with a different new system from middle school. I'm just here to help you in achieving the 9th grade. The main problem in freshman year is "I don't understand the subject" or "I have too much homework." Put the phone away, and no not just on your desk but actually in your backpack and out of your view. Having your phone next to you is one of the big reasons for not understanding the topic, so next time zip it away! I'm in high school, and I know how scary it is with all these older kids staring at you. I also know that freshmen are the low man on the totem pole. Just walk into the school and don't let their looks make you feel self-conscious. You're fine because you aren't the only freshman. Everyone was a freshman once. it can make my whole day. In this installment of In My Own Words, Brooke Smith shares her freshman experience playing volleyball. A perfect example of it's the journey and not the destination that's important. This year, I played volleyball on the Lampeter-Strasburg High School team. It was my fourth year playing the sport, but it was definitely a season to remember. Not only were the practices, games, and tournaments fun, but I also enjoyed getting to know my team. Here are some the really cool things we did together. I will never forget these experiences especially because we documented them all through the LSGirlsvball Instagram page. These activities allowed me to grow closer to the girls and created a team bond. I also learned a lot about the game this year. My favorite position was outside hitter. I recently went to see the movie The Hate U Give at Penn Cinema. I have to say I usually get antsy during movies and wonder how much longer until it will be over. This time was a very different story. My heart was beating the whole time wondering what was going to happen next. I never once looked away from the screen. It is a movie that everyone should see some time in their life. This movie is based on a book I began to read over the summer. It is about an African American girl named Starr who lives in an urban neighborhood called Garden Heights. She lives with her two parents and her older brother Seven and little brother Sekani. Starr lives in two very different worlds; she goes to a private school made up of predominately white kids and lives in a neighborhood made up of mostly African Americans. Being a miniature pig owner may sound like a whole lot of fun, but think again. Taking care of a pig is a lot of work and takes a lot of time. I have a miniature pig. They are a lot of work and very time consuming plus I don't have a lot of time on my hands. Pigs typically are supposed to be outside animals or in a barn but miniature pigs are allowed to be considered house pets. Miniature pigs are very intelligent so it does not take long to litter box train a pig but the bad thing about them using litter boxes is when it is not cleaned frequently it starts to smell really bad. Cleaning the litter box is one of the time problems and a very smelly problem that can attract flies if not cleaned. It is almost universal agreed that The Mousetrap has one of the best twist endings in history. 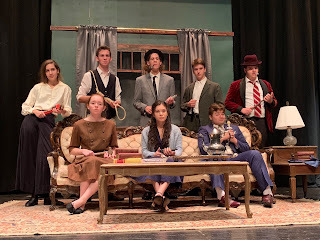 Lampeter-Strasburg theater goers got to experience this twist last week when the L-S Thespian Society presented this famous "whodunit" by Agatha Christie. Directed by high school English teacher Mrs. Susan Rettew, the show included this cast of characters Giles and Mollie Ralston were played by Person Castor and Katrina Herrera. The owners and managers of Monkswell Manor. They are the only staff. It was there opening when they had their first full house. The trees, green and fluffy like a bunny’s cotton tail. Its trunk, thicker than that of an elephant’s. Its leaves green, but on the brink of turning orange, red, yellow, the sign of fall. The air clears my mind, cleans my thoughts, my head. The leaves on the ground are so beautiful. Opinion: What Are Electronics Doing To This Generation? How often do you find yourself on an electronic device? 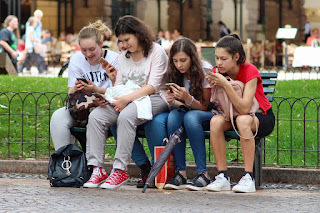 Most teenagers spend about nine hours a day on a device. That is a lot of time down the drain. Electronics are changing the way kids think and act. 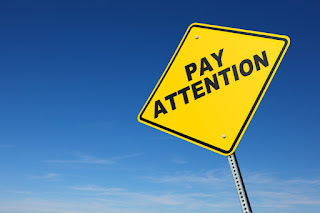 Some kids will spend all day locked in their room on their phone or other electronics. They do not enjoy quality time with their family or friends. Some kids think that the whole world revolves around electronics. Life with electronics is so different from life without electronics. Kids who had no access to devices were sociable. They played games with their friends and family. They spent time outside enjoying fresh air. Kids now just sit inside by themselves and play video games or watch videos. The one way kids will talk to others is if they are face timing their friends or if they are playing the same video game together. Children rarely spend any time with the people they love. In My Own WordsIn this installment of In My Own Words, Michael Hayes talks about the final performance of the 2018 marching band season. On Saturday, November 3, the Lampeter-Strasburg Marching Band performed for the last time their 2018 show "Voices." To thank the community for their support on Tag Day, the marching band's one and only fundraiser for the entire year, we set up a performance to celebrate them. Originally, this "Tag Day Performance" was scheduled for October 11, but due to certain circumstances, (a.k.a weather) that event was postponed. Before they arrived on the field, the band members celebrated their seniors, since this would be their last time marching. During these heartfelt speeches, the seniors talked about their own experiences and their advice for the freshmen, sophomores, and juniors. One memorable speech was senior Pierson Caster, who said, "The experience doesn't change, but the perspective does." 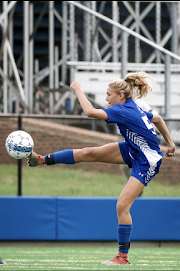 In My Own WordsIn this installment of In My Own Words, Jenna Daveler talks about playing soccer on the varsity team as a freshman. This season I played on the Lampeter-Strasburg Girls Soccer team. When I first started I was really nervous because I was trying out with girls much older than me. The year before I played for PA Classics Development Academy. After the first week of preseason and tryouts I got the e-mail that I made Varsity. I was so excited but also very nervous at the same time. My coach told me that she wanted to me to play as a striker position and score goals for the team. After she told me that I was hesitant because I have played defense for so long. To some individuals they are freshman, to some they are rookies, to others they are simply new members, but to the FFA, they are Greenhands! Greenhand members of FFA chapters are active, first year members. These students are working to obtain their first degree in the FFA, the Greenhand Degree. The Greenhand Degree is the first step on a ladder of degrees that any FFA member can recieve. Our Garden Spot FFA Officer Team and the Lancaster County Officer Team organize special evenings to welcome Greenhands and help them get involved. On October 29, every Greenhand in the Garden Spot FFA Chapter was invited to “hit the bullseye with their Greenhand Degrees”. The Garden Spot FFA Officer Team created stations and games to help our Greenhands learn about FFA official dress, the FFA motto, the degree ladder, Career Development Events, the FFA motto, and what they can do to succeed as an FFA member. nice blue clear sky, with a little bit of dark clouds. The Mousetrap is a play about eight people who all get stuck at a guest house, Monkswell Manor, in the winter. One of the people there is a murderer and is picking off people who are related to a crime that took place several years ago. Everyone is scared for their life when they realize that the killer is among them and they are all trapped together. The Guesthouse is run by Mollie and Giles Ralston. There are four expected guests, Christopher Wren, Mrs. Boyle, Major Metcalf, and Miss Casewell. There is also an unexpected guest Mr. Paravinci. Alongside the guest and owners of the establishment is Detective Sergent Trotter. Mollie Ralston is a young woman running Monskwell Manor with her husband. 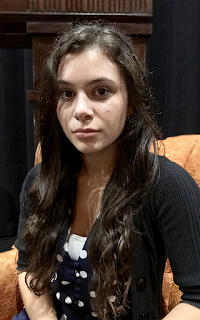 Mollie is played by Katrina Herrera. Giles is a playful young man running Monskwell Manor with his wife. Giles is played by Pierston Castor.